Finding the perfect wedding dress can be a complicated matter. There’s a lot more to it than setting a budget and hitting all the best shops. Regardless of your budget, there’s always something beautiful and cheap, including the wedding dress. If you feel like you’ll never find the wedding dress of your dreams, here are 10 ideas to keep in mind. Buying a wedding dress isn’t the same as shopping for other kinds of clothes. For bridal wear, you do need the expertise of an experienced salesperson. If you try to squeeze in an evening appointment at the bridal store after work, all you’ll find is a couple of worn-out store staff watching the clock. It’s a far better idea to consider taking a day off, and going in first thing in the morning. Guests at a wedding get to sit on either side of the aisle. Most of the time, then, they only get to see a side view of the bride, or her back. While the front of the dress is important, it makes sense to pay attention to the other angles too. You want to look fabulous overall, don’t you? Most wedding photos only show the bride waist up. The top of the dress, the shoulders included, will be what most people get to see in the photos. It’s far more important to focus on what the top of each dress looks like. Make sure the top of your wedding dress is comfortable – many brides pick the wrong size and end up thinking of the time they can get rid of that wedding dress all day long. Timelessness is the most appreciated quality in a wedding gown. Not many trends stay on to become long-lasting. While you do want your dress to be modern, you need to be on the alert for anything that seems gimmicky. Vintage wedding dresses are great options – choosing the one will make you look unique and special. Bridal shops tend to be touchy about allowing cameras in. They fear that if clients get photographs of the dresses they have, they could take them home and shop on the Internet for a cheaper price elsewhere. Even so, some shops do allow them. Getting a friend to take pictures of you in each dress can be very useful. Photographs can give you a far clearer look at each dress than a mirror ever could. Remember that you can’t really tell how a dress looks until you wear it. Wedding dresses that look wonderful on the hanger can look shapeless once you wear them, and dresses that look so-so can look sharp. While it can be hard to try on a half-dozen dresses at a store, that’s exactly what you need to do. It is a good idea to ask each store how many dresses they will allow you try on. Stores have their own policies in this area. It’s a good idea to shop for your wedding day undergarments before you shop for your wedding dress. Having the exact set on when you try various dresses will help you understand better how they fit. Don’t go overboard, though. Opt for comfortable and budget-friendly undergarments to save more money for your wedding dress. Typically, the way wedding dresses are tailored, they tend to need larger size numbers than regular clothes. If you find that a wedding dress that’s right for you is three dress sizes larger than you would normally buy, it’s nothing to be alarmed about. You need to feel comfortable in your wedding dress so the dress size really matters. Remember that bridal shops have a special return policy. 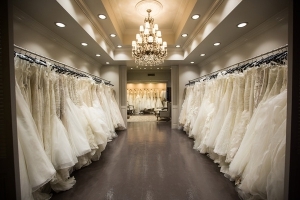 At many bridal shops, sales once made are considered final. Once you leave the store, there’s no turning back. The same goes for any accessories that you may buy. Whatever you get, you need to be completely sure about it – you don’t get to return them. For each dress that you try on, you need to make sure that you ask yourself how you feel. Can you sit in it, dance in it and climb up stairs in it? Does it make you feel self-conscious? No matter how beautiful a dress looks on the hanger, what it does for you when you wear it is usually a completely different matter.